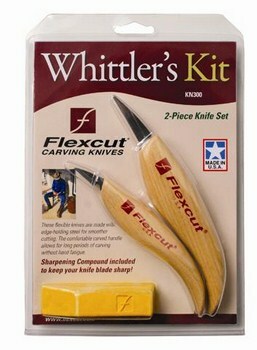 Flexcut Whittler's Kit KN300 Style KN300. Whether you whittle professionally or just for fun Flexcut's whittling knives will give you better results. These flexible knives are made with edge-holding steel for smoother cutting. Each kit includes a 583 Detail Knife 513 Mini-Detail Knife and a bar of Flexcut Gold polishing compound.